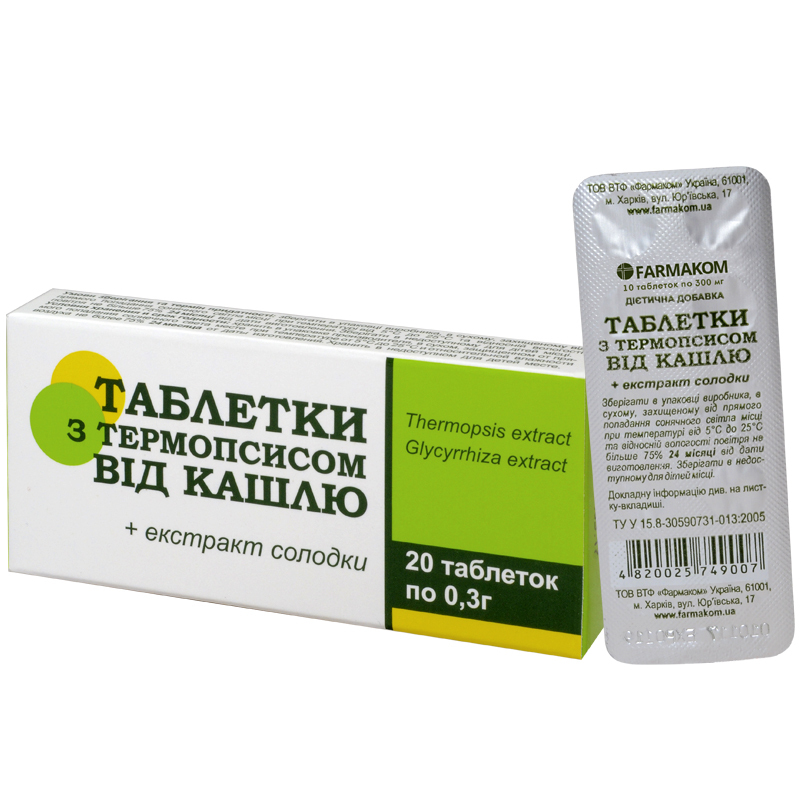 The product relieves dry and productive cough, promotes improvement of bronchopulmonary system functioning in case of seasonal catarrhal diseases. It has soft expectorative effect. Sodium bicarbonate – 240 mg, dry whey – 42 mg, Aerosil – 6 mg, calcium stearate – 3 mg, microcrystalline cellulose – 2.85 mg, carboxymethyl cellulose – 2.85 mg, Thermopsis extract – 1.71 mg, licorice extract – 1.59 mg.
Thermopsis extract stimulates respiratory center, providing expressed expectorative action, which is manifested in intensifying functioning of ciliated epithelium and accelerating secretion discharge, intensifying tone of smooth muscles of the bronchi. Licorice extract irritates mucosa, intensifying endocrinal apparatus secretion. The effect of licorice is determined by the presence of saponins in the raw material, which have expectorative, soothing and enveloping effect. Sodium bicarbonate stimulates bronchial glands secretion, promotes sputum thinning. Adults take 1 (one) tablet 3-4 times a day, children over 12 take 1 (one) tablet twice a day for 3-5 days. Retreatment is possible in 2-3 weeks if necessary. Proteins – 0 g, fats – 0 g, carbohydrates – 15,34 g.